Tubercles are small, raised, circular bumps along the edge of the dorsal fin or dorsal ridge on porpoises’ backs. 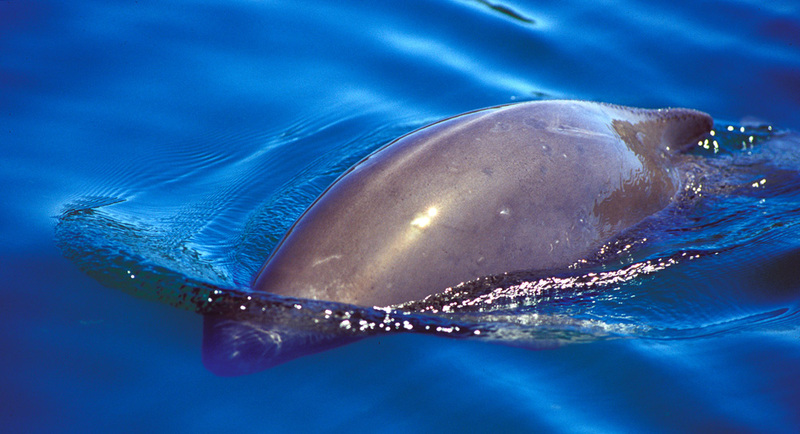 A Burmeister’s porpoise in Chile, with clearly visible tubercles on the leading edge of the dorsal fin that have given the species its scientific name. Photo by Sonja Heinrich. Though the function of the tubercles is unknown, their position, hardened structure and increased outer layer of the epidermis suggest that they may have hydrodynamic importance. Ginter, Carly C. ; Böttger, S. Anne ; Fish, Frank E. (2010). Morphology and microanatomy of harbor porpoise (Phocoena phocoena) dorsal fin tubercles. Journal of Morphology. Buhl, E. H. ; Oelschläger, H. A. (1986). Ontogenetic development of the nervus terminalis in toothed whales. Anatomy and Embryology. « Previous entry "CIRVA"Next entry »"ASCOBANS"